Come one, come all, to SEWASP’s Equipment Day! Bring family, participants, friends, and volunteers. We’ll work on cleaning, repairing, safety checking, and inventorying our ski equipment to prepare for next season. It is also a fun time to hang out with other participants, volunteers, and families. No experience necessary. We hope to see you there! When: Saturday May 11th, 2019. Starting 9:00 am. Don't worry if you can't get there right at 9:00am. We are generally still working on equipment until about 3:00pm. If you can only stay part of the time, that is OK too. Rain or shine! 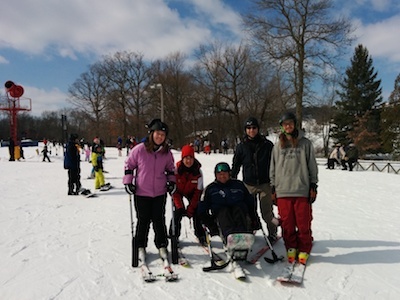 SEWASP (pronounced "see-wasp") provides adaptive alpine skiing and snowboard lessons for people with disabilities in southeastern Wisconsin and surrounding areas. "Adaptive" refers to the modified equipment and teaching techniques used to enable skiers and snowboarders to participate safely and as independently as possible. Instruction is generally provided at Alpine Valley Ski Resort near East Troy, Wisconsin (southwest of Milwaukee on I-43), on Thursday evenings from January through mid-March. SEWASP is recruiting volunteer instructors and community volunteers for the 2019-2020 ski and snowboard season. Dry-land clinics are held Thursday evenings in October/November. 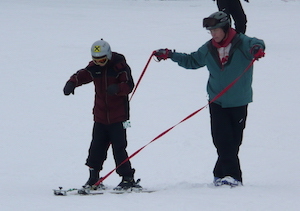 On-snow clinics are held in December. Lessons occur on Thursday evenings and Saturday mornings, and begin the first or second Thursday after New Years. Please contact us if you are interested. For application & training dates, please click the "read more" link below. SEWASP, its participants, and its volunteers were featured February 26, 2014 in a five minute video segment on Fox 6 News Milwaukee.